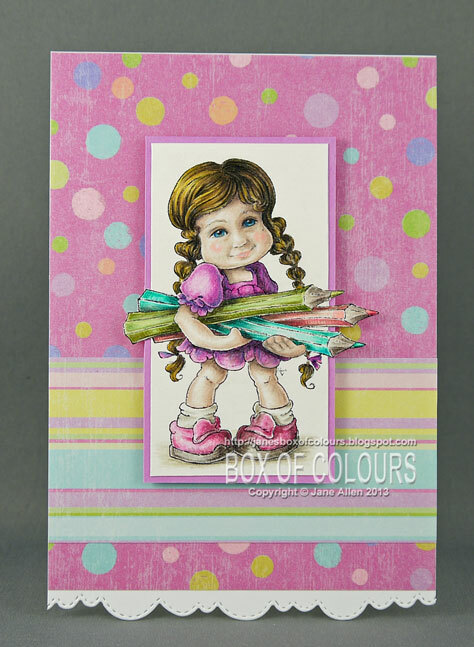 Jane's Box of Colours: Lets face it! Why does it not have a face? Well I have and if I am honest it has led to me ignoring my Magnolia and Hanglar collections! Magnolia/Hanglar purists please look away now!! I am reasonably pleased with the results....however, I feel it is a little too early for me to produce a tutorial at present, I would like to master the technique first, but I intend to share with you how I do it in the not too distant future. Although I am pleased with Tilda's face I am not so happy with either her hair or fingers.....I need to work much harder on these areas, but as they say "practice makes perfect". 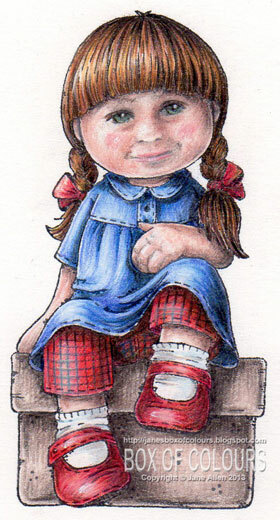 This one is already calling for a re-do - so I may very well pull the image off the card and have another stab at it!! Oh and apologies for not visiting your blogs over the last few days but I have been a little preoccupied with other things but normality should resume shortly. It was never my intention to offend, I merely wanted to share with my readers how I had attempted to solve the one issue that had led to my Magnolia & Hanglar Stanglar collections being ignored and unused. Ny on every time I gave a non-crafting friend or family member a card or gift with one of these characters on it I heard the same comments regarding the lack of features. some were very positive, whilst others were quite frankly downright rude. There have also been questions raised regarding the copyright of stamped images - a grey area at the best of times. the stamps I am sad to say continue to gather dust! OMG Jane! They are outstanding!! Way to go Jane! Looking forward to the tutorial. Yes i am one of the purist that you posted about, lol, however having said that, i havent seen anybody do a better job on adding a face to these little darlings, if i may say, i think that Tilda's eyes may be just a tad too low for her face, but i really love what you did, YOU ROCK!!! Well that is amazing, I'm not that keen on draw faces, but my word your faces are brilliant! that is very clever! the eyes are stunning! OMG Jane! They are amazing and a little funny too! So strange with that faces!!! Each to their own opinion. I find them strange and the little girl sweetness has gone. The faces are too old looking. Great drawing though for other images. The faces re well drawn, and you certainly are a talented artist, but these faces are too old for the images, in my opinion. The innocence and sweetness conjured up by the 'faceless' images are lost. I admit I am a Magnolia purist and love her sweet face as it is. That being said your artistry is truly AMAZING and I have to say I think you've done a fabulous job! OMG, she is so adorable!!! I like so much your fantastic colouring: you are an incredible artist. WOW that makes a huge difference Jane. You're so talented girl. Hugs! Agree with Jen Leeflang. Granted, you are talented, but these faces are way too creepy and old for what the Magnolia images were intended to be. Well, colour me impressed. :) I love Tilda as she is, of course, but I know exactly what you mean regarding other (non-crafty) people's reactions to her. Your work is amazing - will be watching with interest (as always) to see how you improve on this! Love seeing people being creative with stamps, and doing something different. Wow how talented are you. They are fabulous.